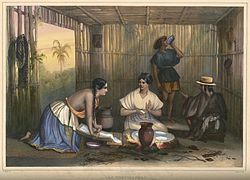 An 1836 lithograph of tortilla production in rural Mexico. Nixtamalization /nɪʃtəməlaɪˈzeɪʃən/ is a process for the preparation of maize (corn), or other grain, in which the corn is soaked and cooked in an alkaline solution, usually limewater (but sometimes wood ash lye), washed, and then hulled. This process is known to remove up to 97–100% of aflatoxins from mycotoxin-contaminated corn. The term can also refer to the removal via an alkali process of the pericarp from other grains such as sorghum. Nixtamalized maize has several benefits over unprocessed grain: it is more easily ground; its nutritional value is increased; flavor and aroma are improved; and mycotoxins are reduced. Lime and ash are highly alkaline: the alkalinity helps the dissolution of hemicellulose, the major glue-like component of the maize cell walls, and loosens the hulls from the kernels and softens the maize. Some of the corn oil is broken down into emulsifying agents (monoglycerides and diglycerides), while bonding of the maize proteins to each other is also facilitated. The divalent calcium in lime acts as a cross-linking agent for protein and polysaccharide acidic side chains. As a result, while cornmeal made from untreated ground maize is unable by itself to form a dough on addition of water, the chemical changes in masa allow dough formation. These benefits make nixtamalization a crucial preliminary step for further processing of maize into food products, and the process is employed using both traditional and industrial methods, in the production of tortillas and tortilla chips (but not corn chips), tamales, hominy, and many other items. In the Aztec language Nahuatl, the word for the product of this procedure is nixtamalli or nextamalli (pronounced [niʃtaˈmalːi] or [neʃtaˈmalːi]), which in turn has yielded Mexican Spanish nixtamal ([nistaˈmal]). The Nahuatl word is a compound of nextli "ashes" and tamalli "unformed corn dough, tamal". The term nixtamalization can also be used to describe the removal of the pericarp from any grain by an alkali process, including maize, sorghum, and others. When the unaltered Spanish spelling nixtamalización is used in written English, however, it almost exclusively refers to maize. The labels on packages of commercially sold tortillas prepared with nixtamalized maize usually list corn treated with lime as an ingredient in English, while the Spanish versions list maíz nixtamalizado. The ancient process of nixtamalization was first developed in Mesoamerica, where maize was originally cultivated. There is no precise date when the technology was developed, but the earliest evidence of nixtamalization is found in Guatemala's southern coast, with equipment dating from 1200–1500 BCE. How nixtamalization was discovered is not known, but one possibility may have been through the use of hot stones (see Pot boiler) to boil maize in early cultures which did not have cooking vessels robust enough to put directly on fire or coals. In limestone regions like those in Guatemala and southern Mexico, heated chunks of limestone would naturally be used, and experiments show that hot limestone makes the cooking water sufficiently alkaline to cause nixtamalization. Archaeological evidence supporting this possibility has been found in southern Utah, United States. The Aztec and Mayan civilizations developed nixtamalization using slaked lime (calcium hydroxide) and ash (potassium hydroxide) to create alkaline solutions. The Chibcha people to the north of the ancient Inca also used calcium hydroxide (also known as "cal"), while the tribes of North America used naturally occurring sodium carbonate or ash. The nixtamalization process was very important in the early Mesoamerican diet, as unprocessed maize is deficient in free niacin. A population that depends on untreated maize as a staple food risks malnourishment and is more likely to develop deficiency diseases such as pellagra, niacin deficiency, or kwashiorkor, the absence of certain amino acids that maize is deficient in. Maize cooked with lime or other alkali provided niacin to Mesoamericans. Beans provided the otherwise missing amino acids required to balance maize for complete protein. The spread of maize cultivation in the Americas was accompanied by the adoption of the nixtamalization process. Traditional and contemporary regional cuisines (including Maya cuisine, Aztec cuisine, and Mexican cuisine) included, and still include, foods based on nixtamalized maize. The process has not substantially declined in usage in the Mesoamerican region, though there has been a decline in North America. Many North American Native American tribes, such as the Huron, no longer use the process. In some Mesoamerican and North American regions, dishes are still made from nixtamalized maize prepared by traditional techniques. The Hopi obtain the necessary alkali from ashes of various native plants and trees. Some contemporary Maya use the ashes of burnt mussel shells, while other Maya cook maize with small pieces of limestone. In the United States, European settlers did not always adopt the nixtamalization process, except in the case of hominy grits, though maize became a staple among the poor of the southern states. This led to endemic pellagra in poor populations throughout the southern US in the early 20th century. A more varied diet and fortification of wheat flour, the other staple food, have essentially eliminated this deficiency. Dry untreated maize (left), and treated maize (right) after boiling in lime. In this case, typical of El Salvador, one tablespoon of lime is used for one pound of maize (15 mL per 500 g), the mixture is boiled for 15 minutes and left to stand for a few hours, and the maize washed well with fresh water. Afterwards, the hulls are removed and the kernels ground into dough. However, exact cooking methods vary according to use and region. Maize was introduced to Europe by Christopher Columbus in the 15th century, being grown in Spain as early as 1498. Due to its high yields, it quickly spread through Europe, and later to Africa and India. Portuguese colonists grew maize in the Congo as early as 1560, and maize became, and remains, a major food crop in parts of Africa. Adoption of the nixtamalization process did not accompany the grain to Europe and beyond, perhaps because the Europeans already had more efficient milling processes for hulling grain mechanically. Without alkaline processing, maize is a much less beneficial foodstuff, and malnutrition struck many areas where it became a dominant food crop. In the nineteenth century, pellagra epidemics were recorded in France, Italy, and Egypt, and kwashiorkor hit parts of Africa where maize had become a dietary staple. Health problems associated with maize-based diets in modern times have usually been remedied by means of vitamin supplements and economic improvement leading to a broader diet, rather than by adoption of nixtamalization. Though pellagra has vanished from Europe and the United States, it remains a major public health problem in lower Egypt, parts of South Africa, and southwestern India. Flowchart of the nixtamalization process. In the first step of nixtamalization, kernels of dried maize are cooked in an alkaline solution at or near the mixture's boiling point. After cooking, the maize is steeped in the cooking liquid for a period. The length of time for which the maize is boiled and soaked varies according to local traditions and the type of food being prepared, with cooking times ranging from a few minutes to an hour, and soaking times from a few minutes to about a day. During cooking and soaking, a number of chemical changes take place in the grains of maize. Because plant cell wall components, including hemicellulose and pectin, are highly soluble in alkaline solutions, the kernels soften and their pericarps (hulls) loosen. The grain hydrates and absorbs calcium or potassium (depending on the alkali used) from the cooking solution. Starches swell and gelatinize, and some starches disperse into the liquid. Certain chemicals from the germ are released that allow the cooked grains to be ground more easily, yet make dough made from the grains less likely to tear and break down. Cooking changes the grain's protein matrix, which makes proteins and nutrients from the endosperm of the kernel more available to the human body. After cooking, the alkaline liquid (known as nejayote), containing dissolved hull, starch, and other corn matter, is decanted and discarded (or sometimes used for making amate bark paper). 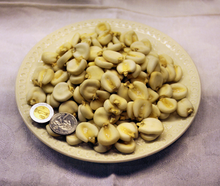 The kernels are washed thoroughly of remaining nejayote, which has an unpleasant flavor. The pericarp is then removed, leaving the endosperm of the grain with or without the germ, depending on the process. This hulling is performed by hand, in traditional or very small-scale preparation, or mechanically, in larger scale or industrial production. The prepared grain is called nixtamal. Nixtamal has many uses, contemporary and historic. Whole nixtamal may be used fresh or dried for later use. Whole nixtamal is used in the preparation of pozole, menudo, and other foods. Ground fresh nixtamal is made into dough and used to make tortillas, tamales, and arepas. Dried and ground, it is called masa harina or instant masa flour, and is reconstituted and used like masa. The term hominy may refer to whole, coarsely ground, or finely ground nixtamal, or to a cooked porridge (also called samp) prepared from any of these. An alternative process for use in industrial settings has been developed known as enzymatic nixtamalization which uses protease enzymes to accelerate the changes that occur in traditional nixtamalization. In this process, corn or corn meal is first partially hydrated in hot water, so that enzymes can penetrate the grain, then soaked briefly (for approximately 30 minutes) at 50°–60 °C in an alkaline solution containing protease enzymes. A secondary enzymatic digestion may follow to further dissolve the pericarp. The resulting nixtamal is ground with little or no washing or hulling. By pre-soaking the maize, minimizing the alkali used to adjust the pH of the alkaline solution, reducing the cooking temperature, accelerating processing, and reusing excess processing liquids, enzymatic nixtamalization can reduce the use of energy and water, lower nejayote waste production, decrease maize lost in processing, and shorten the production time (to approximately four hours) compared to traditional nixtamalization. Effects of enzymatic nixtamalization on flavor, aroma, nutritional value, and cost, compared to traditional methods, are not well documented. The primary nutritional benefits of nixtamalization arise from the alkaline processing involved. These conditions convert corn's bound niacin to free niacin, making it available for absorption into the body, thus helping to prevent pellagra. Alkalinity also reduces the amount of the protein zein available to the body, which improves the balance among essential amino acids, although the overall amount of protein is reduced. Secondary benefits can arise from the grain's absorption of minerals from the alkali used or from the vessels used in preparation. These effects can increase calcium (by 750%, with 85% available for absorption), iron, copper, and zinc. Lastly, nixtamalization significantly reduces (by 90–94%) mycotoxins produced by Fusarium verticillioides and Fusarium proliferatum, molds that commonly infect maize, the toxins of which are putative carcinogens. ^ Doralinda Guzmán-de-Peña (2010). "The Destruction of Aflatoxins in Corn by "Nixtamalización"" (PDF). In M. Rai; A. Varma. Mycotoxins in Food, Feed and Bioweapons. Berlin Heidelberg: Springer‐Verlag. doi:10.1007/978-3-642-00725-5_3. Retrieved 2019-04-12. ^ Harold McGee (2004). On Food and Cooking: The Science and Lore of the Kitchen. New York, New York (USA): Scribner. p. 478. ISBN 978-0-684-80001-1. Retrieved 23 January 2013. ^ Staller, John E.; Carrasco, Michael (2009). Pre-Columbian Foodways: Interdisciplinary Approaches to Food, Culture, and Markets in Ancient Mesoamerica. Berlin: Springer-Verlag. p. 317. ISBN 978-1-4419-0471-3. ^ Ellwood, Emily C.; Scott, M. Paul; Lipe, William D.; Matson, R.G. ; Jones, John G. (2013). "Stone-boiling maize with limestone: experimental results and implications for nutrition among SE Utah preceramic groups". Journal of Archaeological Science. 40: 35–44. doi:10.1016/j.jas.2012.05.044. Retrieved 2018-07-21. ^ Jennie Rose Joe; Robert S. Young (1993). Diabetes As a Disease of Civilization: The Impact of Culture Change on Indigenous People. Walter de Gruyter. ISBN 978-3-11-013474-2. Retrieved 2007-10-15. ^ Linda Murray Berzok (2005). American Indian Food. Greenwood Press. ISBN 978-0-313-32989-0. Retrieved 2007-10-15. ^ "Guatemalan Tortillas: How To Make Them And Why To Eat Them". Retrieved 2018-08-03. ^ Latham, Michael C. (1997). Human Nutrition in the Developing World. Food & Agriculture Org. p. 183. ISBN 9789251038185. ^ Rucker, Robert B.; Zempleni, Janos; Suttie, John W.; Donald B. McCormick (2010). Handbook of Vitamins, Fourth Edition. CRC Press. p. 192. ISBN 978-1-4200-0580-6. ^ von Hagen, Victor Wolfgang (1944). The Aztec and Maya Papermakers. J. J. Augustin Publisher. p. 57. ISBN 978-0-87817-206-1. ^ "What is Hominy?". Retrieved 2011-01-31. ^ "Technological Limitations of the Nixtamalization Process". Archived from the original on 2011-07-14. Retrieved 2011-01-31. ^ "Selective Nixtamalization of Fractions of Maize Grain". Archived from the original on 2011-07-28. Retrieved 2011-01-31. ^ "What's the difference between corn meal and corn masa?". Archived from the original on 2011-07-13. Retrieved 2011-01-31. ^ a b Wacher, Carmen (2003-01-01). Nixtamalization, a Mesoamerican technology to process maize at small-scale with great potential for improving the nutritional quality of maize based foods. Archived from the original on 2018-03-05. "Wacher, Carmen "Nixtamalization, a Mesoamerican technology to process maize at small-scale with great potential for improving the nutritional quality of maize based foods" (2003)" (PDF). Archived from the original (PDF) on October 1, 2011. Retrieved October 12, 2009.